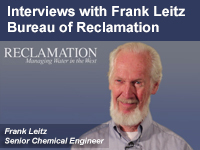 In these three short video interviews, Frank Leitz, Senior Chemical Engineer with the Bureau of Reclamation shares stories and lessons learned from his work on water purification and desalination projects. In the first video, “Lessons-learned: Cost-modeling for Desalination Projects”, Frank shares some historical lessons from his experience estimating the cost of desalination projects. In the second video, “The Pioneering Role of the Yuma Desalting Plant in Large-Scale Membrane Desalination”, Frank provides some interesting background to the story of the creation of this historic and innovative project. In the final video of this set, “What was a major success of the Desalination and Water Purification Research Program (DWPR)?”, Frank describes some of the key achievements of this very successful program. This resource, produced in cooperation between the Bureau of Reclamation and The COMET® Program, a part of UCAR's Community Programs, is hosted on COMET's YouTube Channel.